"There is growing concern among Canadian public officials about a recently proposed anti-terrorism law that they fear could come at the expense of Canadians' personal liberties." 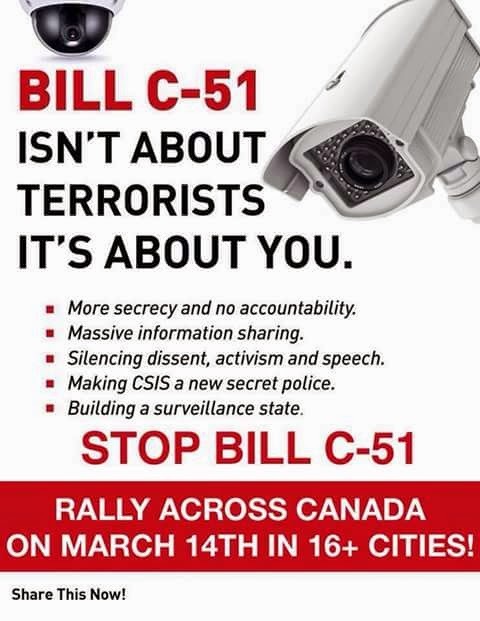 Bill C-51 — which NSA whistleblower Edward Snowden called "an emulation of the American Patriot Act" — is part of a conservative platform to crack down on crime and terrorism and gives expansive new powers to police and intelligence agencies to do so. In particular, it removes prohibitions on sharing information and would make information much more free flowing among 17 different government agencies. Christy Clark, the Premier of British Columbia, is one of the latest to question whether C-51 goes so far as to "impinge" on people's rights. "We should be very careful in Canada, in a country where so many people have sacrificed their lives to preserve our freedoms, to make sure that we aren't — in the effort to protect ourselves against unknown threats – really diminishing our personal freedoms," Clark said on the television program Questions Period. "We will regret that forever. When you give up personal freedoms, it's very hard to get them back." New Democrat Party leader Tom Mulcair last month called the bill "dangerous" and "over-reaching.” And four former prime ministers — Joe Clark, Jean Chretien, John Turner and Paul Martin — have publicly called the bill into question, publishing an open letter in February along with more than a dozen other prominent Canadians. "Given the secrecy around national security activities, abuses can go undetected and without remedy," the letter read in part. "This results not only in devastating personal consequences for the individuals, but a profoundly negative impact on Canada's reputation as a rights-respecting nation." Echoing activists' concerns about anti-terror laws in the US, some First Nations' groups are worried about the powers of the proposed legislation to criminalize activist operations at a moment of robust political activity among native Canadian communities. "While we support efforts to combat true terrorism, there is a lack of adequate definition of the term 'terrorism' that could lead to abuses of power," Chief Lloyd Oronhiakhète Phillips of the Mohawk Council of Kahnawà:ke said in an open letter to Stephen Harper. "There will be great potential to label our people as 'terrorists' when they may, in fact, be simply defending or supporting Aboriginal rights or Title. Our people have spent many years marginalized and deemed 'troublesome'"
One of the other prominent signatories of the aforementioned letter, which said C-51 lacks "robust accountability," was former Supreme Court Justice John Major, who also appeared on Question Period and brought up the issue of oversight. "When we speak of oversight, I don’t think any of us think the agencies are going to deliberately extend their reach. But the fact is they have a job to do, they think it’s important, they get over-enthusiastic when they think they’re hot on the trail of something, and it’s very easy to slip over the edge," said Major. "We’ve seen it with police forces, we’ve seen it in the past with CSIS [the Canadian intelligence service]." Prime Minister Stephen Harper, however contends that C-51 grants powers essential for nabbing terrorists before they strike, and criticized his political opponents for taking aim at the bill. "Now is not the time for the NDP agenda of attacking the police and the security agencies," Harper said in a television appearance in February. "We have serious problems in this country. Now is the time to take on the terrorists and that is what we're doing." "And that’s what governments before have felt as well," Kenney said. "That an objective, independent group of experts that are not part of Parliament or politics should be taking a look at the operations of CSIS." Even supporters of the bill's mission, in theory, were perturbed by its overreach. "The bill would share with national security agencies potentially all of the information of all Canadians, including law-abiding citizens. And I think that goes too far," Canada's privacy commissioner Daniel Therrien told Question Period, also questioning the lack of limits placed on how long an agency might store collected information as one potential weakness. "I don’t minimize the security risk at all," Therrien told the Ottawa Citizen. "But it’s not a question of it’s either security or privacy."